The Chinese HongQi 9 SAM aka HQ-9 is a long-range, all-altitude, all-weather surface-to-air missile system developed by the China Academy of Defence Technology. Its believed that the system is based on a reverse engineered US Patriot SAM, however there is no substances in this rumour. China has operated the Russian S-300PMU-1 since the 1990’s and to date is the largest export client of the system. 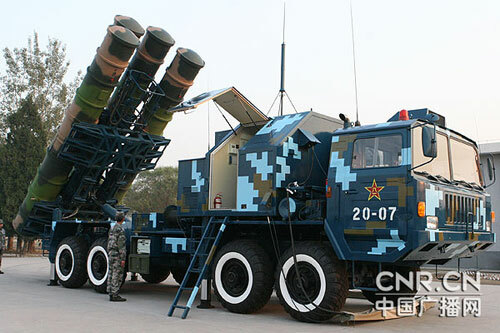 Certain S-300PMU technologies were used to improve the HongQi 9 design. The HongQi 9 is believed to have benefited from S-300’s solid rocket, aerodynamic layout, gas-dynamic spoilers, and launcher technologies. This has resulted in a modified HongQi 9 which is ‘cold-launched’ vertically from a S-300-style tube launcher system. Four tube launchers are carried onboard a 8X8 TEL vehicle with cross-country capability. However the system is still rather dated compared to other designs and so China has stuck to the continued importing of the Russian S-300 which now out number the number of HongQi 9 in service. It is rumoured that China are licensed to manufacture the S-300 under the designation HongQi-15 (HQ-15).